December 23, 2015 December 21, 2015 / Elizabeth T.
While I can largely agree with one of my dad’s favorite holiday jingles (though ‘All I Want For Christmas’ will always be my most-loved jam), Christmas is actually kind of stressful, especially with all of the last minute shopping and gift giving to take care of. Although I usually shop for all of my gifts after Thanksgiving (I hate procrastinating haha), there’s always something unexpected that comes up, like some last minute gifts for some acquaintances or family friends that are in town. So without a doubt, every year on the week of Christmas, I’m always running left and right trying to get everything together in time for one of the most festive holidays of the year. On days like this, I prefer to stay comfortable and cozy, but that doesn’t mean I have to be lazy. Instead, I like to add just a bit of edge to my outfit by pairing a simple scoop neck sweater with some androgynous joggers instead of my usual skinny jeans. The joggers add an instant touch of sporty chicness to the outfit, and the best part – they’re so comfortable and warm, almost like sweatpants, though they don’t look sloppy at all due to the subtle zipper details. Also, Los Angeles has really been chilly lately, especially since we just got some rain over the weekend (yay for us because we’re in such a severe drought – though I doubt that little drizzle really helped, but anyway…). In order to stay warm and equipped for the weather, I finished the ensemble with one of my newest favorites – my plaid longline coat. It’s such a great statement piece because the length adds just the right touch of androgyny to the outfit due to the feminine cutting of the coat and masculine silhouette of the overall look. I also love how thick and warm it is, since the length keeps my whole body nice and toasty in this cold, cold weather. Likewise, the plaid pattern makes it really stand out amongst a sea of colored coats, and of course, the season’s most loved textures add just the right touch of subtle festivity to an otherwise simple and chic outfit. 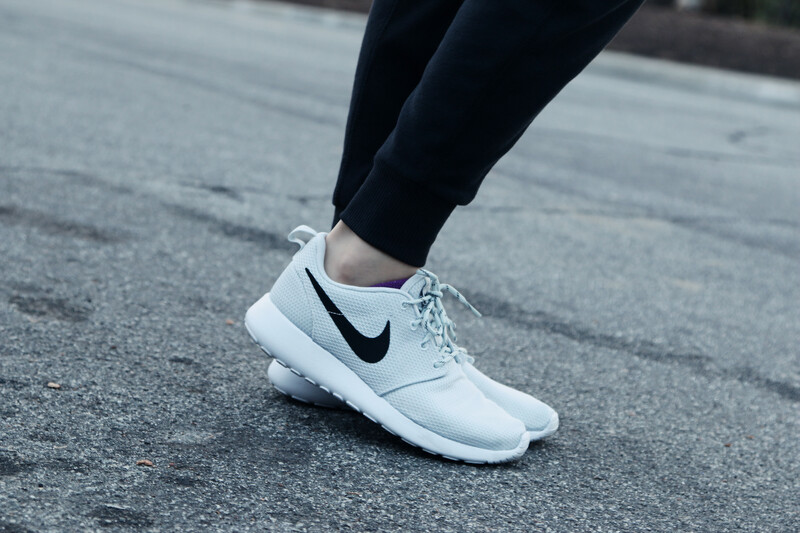 To finish off the whole ensemble on a sporty note, I opted for my new favorite sneakers – my Nike Roshe Ones! 🙂 They’re not only super pretty, they’re so comfortable to walk around in. I love how lightweight they are, and the platinum mesh makes it that much more of a statement piece rather than your regular old sneakers. Casual looks never have to be boring. With just the right attention to subtle details and textures, you can upgrade your simple outfit into an effortlessly chic ensemble as well. You look gorgeous honey, and I hope you enjoy the holiday season & will get to relax and enjoy yourself. Merry Christmas & happy new year, babe! You’ve been such a star and I am so thankful for your support on my blog! Muaaah! Haha it’s definitely my kind of outfit too, Nadia 😛 Comfort beats everything, right? Haha and yes, the sneakers are so comfortable! Nice outfit. Love your sweater I think it add your extra beauty. Thank you Emelia 🙂 The sweater is super comfy too! Thank you Reagan 🙂 My new fave! Such a beautiful outfit! Love this plaid coat! Haha I can’t agree more Tiffany 🙂 And yes, these sneakers are my current favorite ❤ Thank you so much for always showing so much support on my blog! Have a warm and safe Christmas as well! I love this look, especially the coat! I sometimes struggle with finding looks that are comfy and still cute, especially because I’m more of a skinny jeans kind of girl. We rarely get to wear coats like that, I’m loving the California weather lately! In love with your coat!! 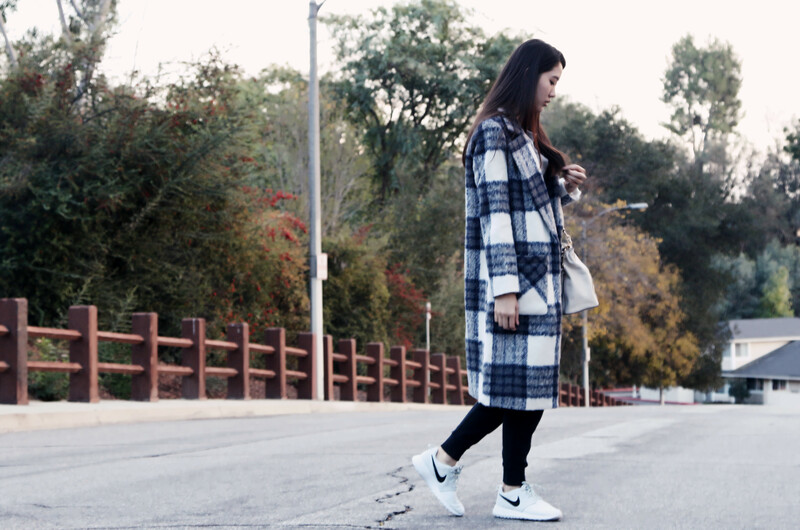 What a cute mix of the plaid coat (love the material) and the Nike Roshe sneakers. A very Korean look. Love it. Oooh love the jacket and Forever 21 has been killing it in the coat department lately. Love! Yes, I totally agree with you! 😀 Forever 21’s coats have been surprising me all season long! Thank you so much for stopping by, love ❤ Merry Christmas! Hahah I know right? 😀 I was very surprised ❤ Super worth the price! Awww thank you so much Yanna ❤ 🙂 I'm glad you like my blog love 😀 So happy that you stopped by, and it's lovely to hear from you! A good friend of mine, Yanna Lee-Abdul, just told me about your blog! I am so into activewear and this post is so perfect! Hi Jessica! 🙂 Thank you so much for stopping by love ❤ So happy to hear from you! Happy Holidays! I LOVE this post, you should be a model! Aww Irene, you’re too sweet! 😀 ❤ Happy Holidays to you too, and thank you so much for stopping by and for your kind words as well! omg you are so cute, I can’t even!!! ❤ ❤ too kawaii!! Aww thank you so much Evangeline ❤ You're tooooo sweet 🙂 Haha and of course, thank you so much for stopping by love 😀 Hope you had a Merry Christmas! Aww thank you so much Simona ❤ You're too sweet 🙂 Happy Holidays to you too love! Hope you are enjoying the holidays babe! Aww I’m so glad that you liked this outfit Lauren 🙂 Haha I love sneakers and nice coat too ❤ Comfort and style are the essentials to any outfit! Hope you're having a wonderful holiday season too, love! Such a cute outfit! I’m all about being comfortable yet stylish at the same time! Perfect comfy OOTD for running left and right haha, and wow to that 31.45$ coat is a steal,xoxo BING. Haha yes, Bing 🙂 It’s so comfortable (especially with the sneakers), and the coat is definitely such a bargain! Really great quality too ❤ Thank you so much for stopping by, and hope you're having a wonderful holiday season! You look so pretty!! and I love your outfit! Thank you so much Vale ❤ 🙂 Glad you liked this post! Happy Holidays! in love with this edgy look! Thank you so much for stopping by, Natalie 🙂 Happy Holidays! I absolutely love this outfit !! Thank you so much Celine ❤ You're too kind 🙂 Hahah hope you're having a great holiday season! Great look dear! Happy 2016! I love these sneakers, so chic! They’re my favorites too ❤ 🙂 Thank you so much for stopping by Kelly! Thank you so much Trang ❤ 🙂 Wishing a wonderful New Year as well! hi elizabeth, did you have a wonderful christmas? 😀 you look so cute in this outfit – that coat looks really really cozy too! and yay to cali getting a little bit of rain! Yes, it was really great Annie 🙂 Did you have a great Christmas as well? And thank you so much! Haha you’re always too kind! Cali has definitely been feeling like winter lately 😛 Hope you’ll have a wonderful New Years too!